At Fort Wayne Outfitters, we're not just any outdoor shop. We're people like you who care about the environment, functional fashion, and quality – and the brands we carry do, too! On every visit, you'll be surprised to find something you just can't find anywhere else, but you can also count on finding the everyday items you need. From bikes to kayaks, rentals to service, a visit to Fort Wayne Outfitters is always worth the trip! 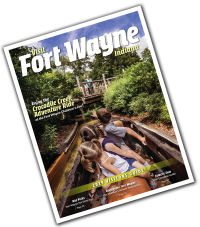 Our mission is to help in keeping Fort Wayne unique by supporting active lifestyles, encouraging riverfront activities, and engaging in environmentally conscious business practices. Maintaining a constant focus on quality products, genuine service, and a distinctly specialized experience. We offer outdoor and fitness apparel, bikes, kayaks, canoes, stand-up paddleboards, yoga accessories and more by some of the top brands in the industry including Patagonia, Ibex, Lole, Prana, Olukai, Scott USA, Thule, Surftech, Perception, Jackson, and Hobie. Rates and Information Stop by to rent a bike, kayak, canoe, or stand-up paddleboard. Livery service available. Reservations recommended. Service Information We service all makes and models of bikes. Just bring your bike in, no appointment necessary. Be sure to check out our events tab and Facebook page to stay up to date on our events year round.